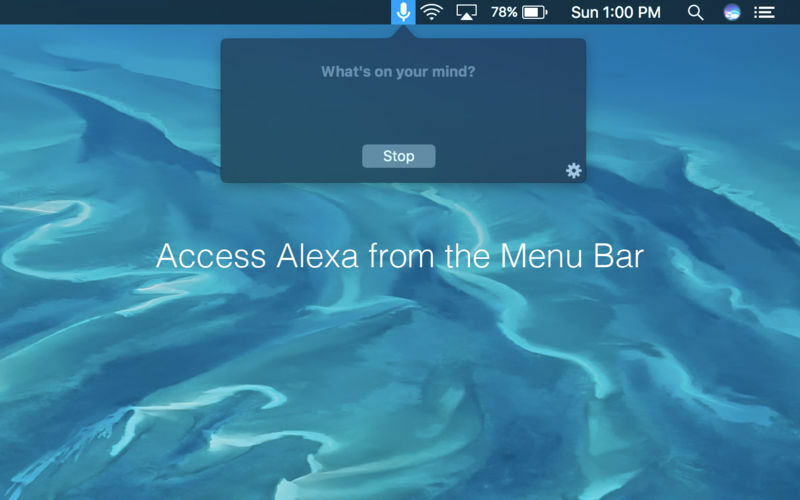 Menu bar Widget for Amazon Alexa. Is there a better alternative to Speak for Amazon Alexa? Is Speak for Amazon Alexa really the best app in Productivity category? Will Speak for Amazon Alexa work good on macOS 10.13.4? Speak for Amazon Alexa gives you access to Alexa on your Mac. Alexa is your personal assistant that can answer questions, report weather forecasts, provides sports scores and schedules, and more using Amazon's Voice Service. Alexa, what is the price of Bitcoin? Alexa, what is the weather forecast for next week in San Francisco? Alexa, what is the capital of Kosovo? Alexa, convert 12 kilograms to pounds. Alexa, what is Apple's stock price? Alexa, how far is Mars? [CRITICAL CRASH FIX] - No more crashing! There was a bug in High Sierra where after you hit the speak/stop button, the app would crash. Speak for Amazon Alexa needs a review. Be the first to review this app and get the discussion started! Speak for Amazon Alexa needs a rating. Be the first to rate this app and get the discussion started!